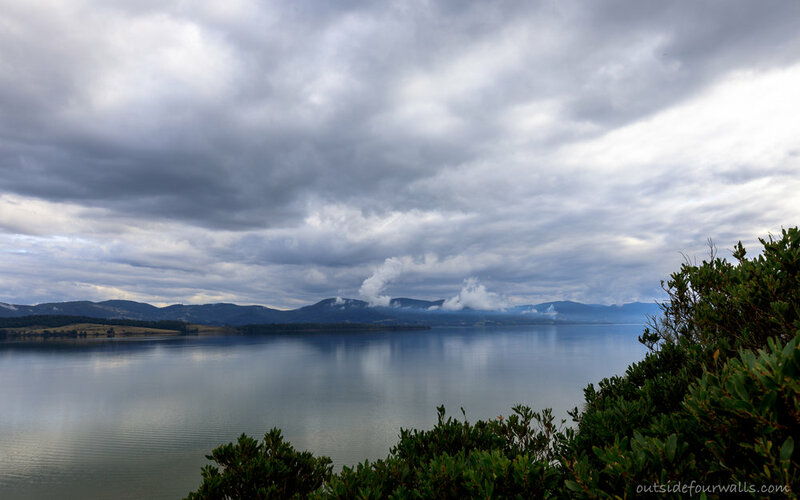 Well it has been a reasonable amount of time coming, but here it is - a blog post (and part two) for the anniversary of our trip to Tasmania in April 2017. You can find part one here. I have to call it an anniversary post as it has taken so effing long for me to extract a digit to get this written up! Jeez, even for me that is incredibly slack... oh well... "better late then never" haha. I just hope I remember most of what I intended to include! We left Eaglehawk Neck and headed off with our next destination once more a surprise to me. Two hours later we were taking the famous Bruny Island Car Ferry over to North Bruny, where we then drove to the beautiful stone cottage we were to stay in at Adventure Bay. 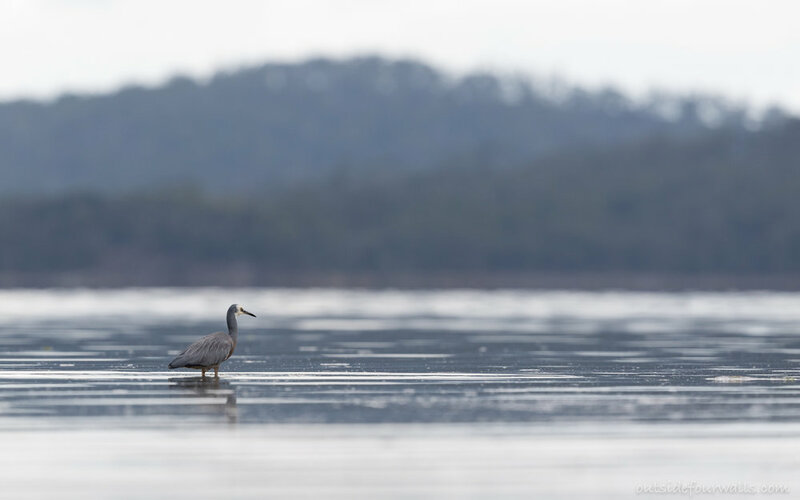 The drive took us over The Neck, a narrow isthmus of land connecting north and south Bruny Island with superb views out of both sides and home to a large resident population of Little Penguins and Short-tailed Shearwaters. 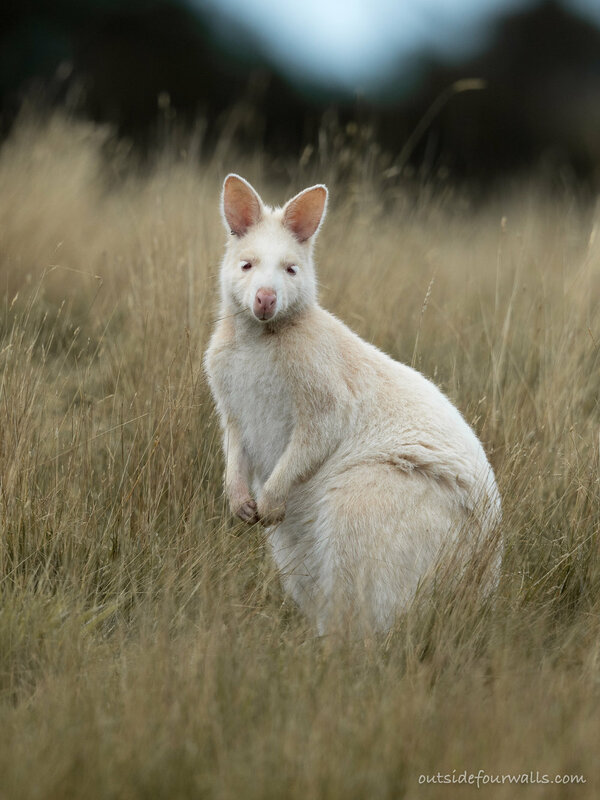 Prior to the trip, I had seen a photo of a rather beautiful albino Bennett's Wallaby (Macropus rufogriseus) from somewhere on Bruny Island and was hoping that we may see it if we were really, really lucky. Our cottage was set back off the seafront on a large area surrounded by grass and was fantastically private; our closest neighbours were industriously feeding Tasmanian Nativehens and a small mob of Bennett's Wallabies WITH A WHITE WALLABY IN THERE! What I did not realise at that exact time was it was mathematically unlikely I was looking at the wallaby from the photo I had seen as there is a population of approximately 200 albino wallabies on the island. Nonetheless, we were captivated by them - they are so incredibly endearing and look like a fictional delight rendered in reality. Gorgeous! The endemic Tasmanian Nativehens (Tribonyx mortierii) were great fun to watch on one soggy afternoon, allowing me to practice my flash technique and providing an opportunity to shoot some video - both skills still well and truly on the initial slope of the learning curve! One of the many surprises that Louise had organised for us was a morning tour at the Inala Nature Reserve, a place we had wanted to visit for some time. Our fantastic guide, Cat, managed to combine all of the essential qualities that make a really great guide - passion, enthusiasm, knowledge and a good measure of banter! We had a great wander around the amazing property that is so essential to protecting some of the superb habitat covered in its 600 hectares, and we picked up almost every single endemic bird we had so far missed, and added better views of a few we had only had fleeting glances of in the previous few days. Now for most birders, ourselves included, one of the big drawcards of Bruny Island is the potential for seeing the tiny and sadly endangered Forty-spotted Pardalote (Pardalotus quadragintus) and Inala is a very reliable site to see them. When I say tiny, they really are - with a length of about 10 cm, a wingspan of about 18 cm, and a weight of about 9 to 13g. Fortunately they showed themselves on our second loop which is really lucky for all in attendance as me throwing a massive sobbing, disappointed hissy-fit would have been embarrassing for everyone. Seriously, I would have been so bloody gutted if we had dipped on seeing them. I managed a few shaky shots as they flitted about well above our heads in the Manna Gums (Eucalyptus viminalis) they rely on. At the end of the tour, we spent some time in the temporary raptor hide and we had superb views of a very dark Brown Goshawk before a male Grey Goshawk (white morph) came in to then be joined by the larger female - what truly arresting and stunning birds they are! We highly recommend a tour at Inala and encourage you to support their excellent conservation efforts.